Certificates of a marriage are governed by states and something every engaged couple should understand. 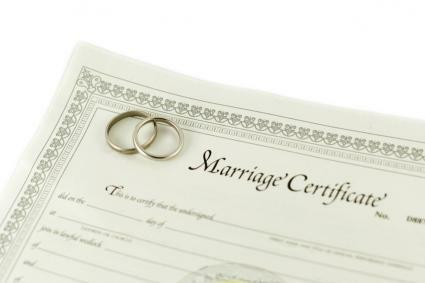 A certificate that states you are married is required when making various legal applications as a married couple or as a form of verification of legal martial status in other circumstances. A marriage certificate is an official document that proves a couple has been married. It includes the names of the persons being married and the place and date of the wedding ceremony. It may also include other information such as the couple's dates of birth, places of birth, parents names, and place of residence. This document certifies that the marriage has been performed in accordance with state laws regarding marital unions. The ordained minister, clergy, or officiary performing the ceremony must provide a marriage certificate upon completion of the ceremony. The certificate must be signed by the person performing the ceremony as well as the newly married couple. It may also be signed by witnesses -- usually the maid/matron of honor and best man. The person performing the ceremony usually sends the marriage certificate to the appropriate local government office for registration. The newlyweds will then receive their own personal copy of the certificate which can serve as both a keepsake and official documentation of the marriage. Having a certificate of marriage is necessary for married couples to prevent any disputes over the legality and validity of the marital union. In addition, this documentation may be necessary for name changes if one of the spouse's takes the other's last name. If you are not provided with a copy of your marriage certificate, lose it, or need a copy of someone else's certificate, you will need to contact your local government bureau of vital statistics. You can usually request it either in person or by mail -- remember to bring proof of identification if applying in person. You will be required to pay a fee, usually ranging from eight to twenty dollars. Be sure to ask what forms of payment are acceptable as some offices may only accept cash. Some outside services, like Vital Chek offer expedited delivering of marriage records. You also have the option to pay by credit card when using a service like this. Generally only a relative, such as a parent, grandparent, spouse, or child, can request an official copy of someone's marriage record. Unofficial copies can be requested by the general public in most places. If the exact year of marriage is not known, the office may search increments of a certain number of years and charge for each search. Keep in mind that if the record you are looking for is not found by the bureau you will still be responsible for the search fees. A marriage certificate serves as proof of marriage, but the marriage license must be obtained prior to the wedding. You can obtain your marriage license from a county clerk of court or probate office. After the ceremony, the officiary signs the license to prove that the marriage has been solemnized. A marriage license shows that the parties engaging in the union of matrimony are both consenting adults and is necessary for the marriage to be legally recognized. The license cost ranges from thirty to seventy dollars, with some states offering discounts to couples showing they have participated in accredited premarital counseling programs. Both members of the couple must be present when applying for the marriage license. Social security cards and ID such as driver's license, passport, or birth certificate must be shown at the time of application. You will be required to provide information such as date and place of birth, father' s name and mother's maiden name, address, occupation, and age. Most couples plan on getting their license about a month prior to the wedding, as the license will expire after a certain number of days, typically 60 to 90. There may also be a waiting period of one to five days before obtaining the license, although some states will waive the waiting period.